Unlike the manufacture of heroin and cocaine, the manufacture of synthetic drugs is not geographically constrained, as the process does not involve the extraction of active constituents from plants that have to be cultivated in certain conditions for them to grow. Yet any analysis of the synthetic drugs market is complicated by the fact that information on synthetic drug manufacture is limited, which prevents the estimation of the volume of such drugs being manufactured worldwide. 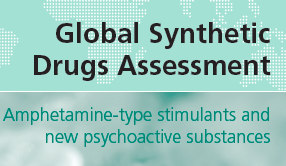 Nevertheless, data on seizures and use suggest that the supply of synthetic drugs is expanding.